You love your pets, but sometimes they’re messy. When it comes to keeping a household clean with pets, the right tools make all the difference. Lots of products label themselves “pet” oriented, but do they really work? The Bissell Crosswave Pet Pro is an upgrade to the Crosswave All-In-One, explicitly designed to tackle common pet issues. Whether you’ve already got the original Crosswave or you’re looking to upgrade your current tools, our Bissel Crosswave Pet Pro review will give you all the details. Let’s see if this is one cleaning tool you need in your arsenal. What Is The Bissell Crosswave Pet Pro? The Crosswave Pet Pro is a multifunctional cleaning tool designed to handle a variety of floor types. It both vacuums and mops your hardwood floor all at once. You can move quickly from your hardwood floor to your area rug without having to change tools. The head is redesigned to handle pet hair. This is a common complaint among pet owners, in fact. The bristles of most vacuums tend to get bogged down with pet hair, causing the appliance to lose suction and break down. 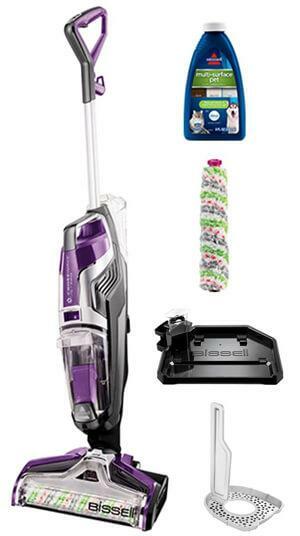 The Bissell widened the head and redesigned the bristle pattern to deliver pet hair to the vacuum’s trap safely, so you don’t have to stop to pull it out. Bissell is one of the best-nonspecialized cleaning tools out there, so we were happy to see another offering in their pet line. This one is intended to be a multipurpose cleaning tool for light soils and pet hair, eliminating the need for multiple tools to get the job done. The Crosswave uses two tanks, one for your cleaning solution and one for dirty water. 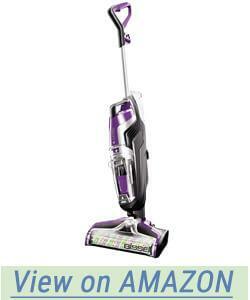 As you move from surface to surface, the wet vacuum gently picks up dirt and debris while the bristles scrub the floor. Water is sucked back up into the vacuum to eliminate puddles. Once inside the tank, pet hair and larger debris are strained out of the vacuum so that when you’re emptying, you don’t worry about creating huge clogs in your drain. Dirty water goes down the drain and pet hair clumps can go in the trash. The controls are simple to use and easy to locate. When you’re ready to begin mopping, it’s just a one-touch control for ease of use. Mopping is basically an on-demand trigger, so if you encounter any soiled areas, you can focus your mopping there, or spray all over your floor as you go for an entire clean. It comes with multiple brush heads for a variety of surfaces and purposes and is easy to take apart to clean thoroughly. One thing we hate is the accumulation of grime and film over some mops and vacuums, so this is a nice feature. When you’re done, empty the water tank and clean the hair filter. It stores upright, or you can hang it up by the handle. The attachments don’t fit into the vacuum body, so you’ll need to find a place for them, but otherwise, it’s simple. Pet owners who have homes on the smaller side, or who don’t allow pets to travel all throughout the house. It’s not powerful enough to handle deep pile carpet, and we think it might be frustrating if you’ve got thousands of square feet to go over. Smaller homes can really benefit from the design. It doesn’t suction water up as powerfully as a true carpet cleaner, but when you’re cleaning daily and need to go over a variety of surfaces, it can be a convenient tool. You don’t even have to move your area rug out of the way (provided it’s a short pile) so you can capture the hair wherever it happens to be. We recommend it for daily use, particularly the vacuum function. If you let pet hair and grime accumulate over a few days, the Bissell may not have enough power or storage for massive amounts of hair. Going over your floors quickly once a day, especially if you have multiple pets, can help keep the volume of hair down and prevent clogging. We also think it could be great as a once-weekly tool if you already have a vacuum or broom that you use solely for the pet hair. If you vacuum or sweep daily to collect hair, this vacuum allows you to get any hair that you’ve missed at the end of the week, quickly mopping up grime and polishing your surfaces. It’s safe to use for sealed wood floors, tile, linoleum, and low pile carpet and rugs. Be sure to test a small surface of your floor beforehand to make sure there’s no trouble and keep a close eye on your brushes to make sure you aren’t accidentally scratching a floor. Never use the mop function on unsealed hardwood floors. 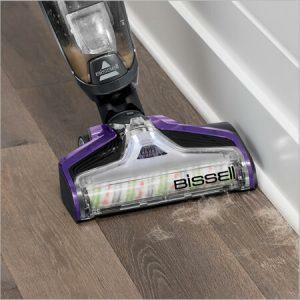 Most Bissell packages come with two trial sizes of their famous floor cleaner so you can get a feel for what you like, and you can get started right away without having to invest in all the cleaning tools at once. They feature Febreeze freshness which helps get stubborn pet odors out of floors and keep the smells away while deep cleaning. We love that little perk. There are interchangeable bristle heads for different types of jobs. The bristle heads have different bristle designs for deeper cleaning or for when you need to get pet hair up more efficiently. Experiment with the combinations to find out which bristle head offers the best solution for your cleaning needs or change them out as you clean the whole house. The cord is very long and should give you plenty of space to move around (25 feet in total). The tank holds 28 ounces, which is enough to handle a small to medium sized area with no issues. If something is particularly soiled, you may have to empty the dirty tank and clean the filter, but this takes just a few seconds, and you’re good to go again. How long is it taking you to clean your floors each time you do it? Do you put off cleaning or mopping because you don’t want to get out a second tool? This could be your solution. Cleaning is cumulative, so anything that prevents you from cleaning a little bit at a time causes more significant problems later. The combination of a mop and vacuum may not be the most in-depth tool, but it can encourage you to keep up with your cleaning little bits at a time. The vacuum function is pretty powerful for a compact sized vacuum. It rotates well, and the specially designed brush head doesn’t get bogged down by a hair (unless you’ve neglected it for a week or two). The biggest draw is the convenience of being able to move across your entire floor area, getting up both debris and being able to tackle light mopping across the whole surface or clean up a single bit of grime when you reach it. It’s lighter than your average vacuum and considerably lighter than your ordinary carpet cleaner. It’s an excellent multipurpose tool if you’ve got a small to medium sized area that sees a lot of pet action. When you combine tools like this, they’ll never be as powerful as their separated counterparts. We’ll just put that out there. 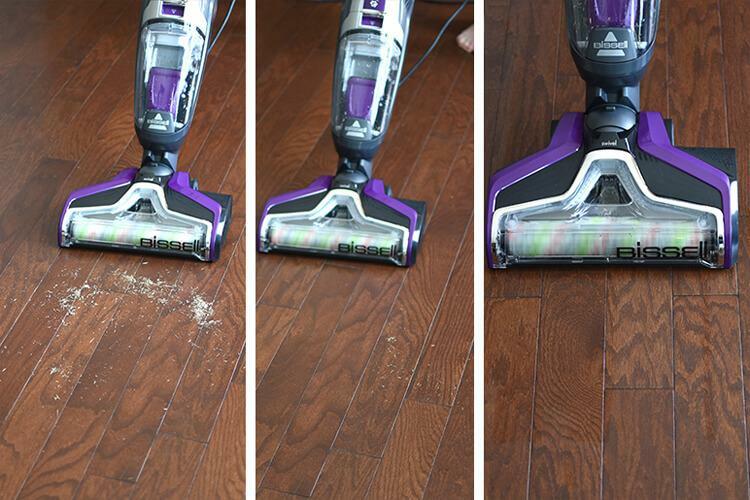 If you’ve got a thick pile carpet, this vacuum doesn’t stand a chance getting up debris. If you’ve got to deep clean your floors, this one won’t take the place of a good old fashioned steam cleaner or mop and bucket. It tends to leave a bit of a puddle on the floor wherever you’ve stopped the mop function, so you’ll need to be careful not to leave it to sit on your wood floors. Carpets and rugs may also need time to dry, so if you’ve accidentally left a thicker wet spot, they may need to be elevated to dry thoroughly. We aren’t sure that it really reduces the amount of time it takes to clean, because we found that we had to go over wet spots again with the vacuum to try to get up any excess water, especially over the rug area. If you’re looking for this to reduce the amount of time you spend cleaning, it’s probably not going to do that. If the act of switching tools is something that causes you to put off cleaning until it’s a huge situation, this may be a great way to help you get back on track. It’s not going to reduce the amount of time you spend cleaning because the vacuum function isn’t as strong, but it will encourage you to go ahead and do your mopping and vacuuming. Those of you with smaller areas to clean could see a significant reduction in the amount of work you have to do overall because you’ll be able to keep up with vacuuming and mopping more easily. If you end up with a spill or a bit of grime, it’s a lot easier to get out the Bissell than it is to fill a bucket with water and mop. Cleaning is all about consistency, and this is a tool that could really increase that. Going at cleaning little by little can be difficult for some people, but the Bissell does help keep things cleaner over the long run. Anyone who struggles with this type of consistency or anyone who needs a gentle push to handle those pet cleaning tasks a little bit every day could find this tool a great asset. It’s also best for people who have small to medium sized areas with multiple floor types that are a pain on cleaning day. If you’ve got an enormous surface area to cover, this one probably won’t be the most convenient. It doesn’t hold enough solution to get across your entire large space, and you may find you have to stop and refill too often to be convenient. Also, the vacuum function may leave your carpet too wet without going over it again and again, so large carpeted areas aren’t suitable. If you don’t have any issues cleaning a little bit every day, this one also may not be the right one for you. It’s not powerful enough to qualify the upgrade from your separate vacuum or mop function, so we aren’t sure you’ll be happy if you end up spending the money. If you’ve already got a Bissell All-In-One, we don’t know that it’s worth it to upgrade to the specific pet one either. Consider how well your current model handles your pet hair and if you spend a lot of time untangling it, you may want to upgrade, but there’s no apparent difference between the two that warrants the automatic upgrade. We do recommend this tool for those of you who need to buy a new cleaning tool anyway. If you’ve already got a vacuum that you love, we don’t know that it’s worth the extra. If your pet hair situation is out of control, you may want to just upgrade to a very powerful vacuum. Definitely get it if you find that switching tools prevents you from keeping your house as clean as you’d like. If you often vacuum but decide to leave your mopping to another day (and it never gets done) or you think that you’ll do the vacuuming later after you’ve mopped (and you don’t), this tool could be the push that finally gets your cleaning consistent. This is an excellent tool for those of you who need to upgrade from a basic mop and broom. It does lend Bissell’s expertise for cleaning up pet messes to the desperate pet owner who needs a new solution to wrangle the mess. If you’ve got a good vacuum and a mop tool you already love, we don’t think this one will be worth the upgrade. However, for those of you who need an all in one device with multisurface capability, it could be a significant upgrade overall. Just make sure it’s something that you actually need or you could find it gathering dust in the back of your closet. Check with your seller about return information and warranties so that if something happens, you’re covered. Overall, it’s an excellent addition to Bissell’s line of pet cleaning tools, and we think there’s definitely some extraordinary potential for the device in the right household. Your beloved pet doesn’t have to be a source of frustration. Get the right tool and get things clean again.